Following years of campaigning for improved road safety measures to be implemented by the Welsh Government along the A470 in Glan Conwy, Janet Finch-Saunders, Assembly Member for Aberconwy, has spoken out at the lack of action following the Community Safety scheme conducted in 2017/18. 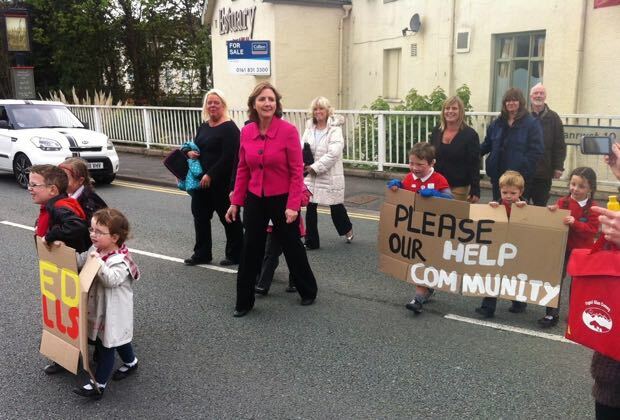 Janet said, “Pedestrian safety in Glan Conwy has been a serious local concern for many years. There have been protests, campaigns, and numerous questions put forward by me to the Welsh Government who are responsible for this trunk road. “Today, the fast and busy A470 still has no crossing that would stop traffic, and to make matters worse, the Welsh Government have just gone and delayed any possibility of positive action. “On 4 April 2017 Ken Skates, Cabinet Secretary for Economy and Transport, wrote to me advising that the Community Safety scheme taking place would review the concerns raised by the public with the view of developing proposals to improve road safety for the community. “A year on, I have queried the result of the scheme, only to be told that the comments received will be taken on board as part of another review, one into Speed Limits at over 600 sites across Wales. “For years, the Welsh Government have known about the concerns, but still they persist on delaying the undertaking of any meaningful action to improve public and road safety in Glan Conwy. Really, this is quite disgraceful”.